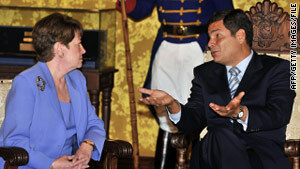 Ecuadorian President Rafael Correa talks with U.S. Ambassador Heather Hodges in Quito in October 2008. U.S. State Department spokesman calls the expulsion "unjustified"
(CNN) -- The Ecuadorian government on Tuesday declared the U.S. ambassador in that country, Heather Hodges, persona non grata and asked her to leave as soon as possible, the state-run Andes news agency reported. The decision was based on a State Department cable made public by WikiLeaks, it said. Ecuadorian Foreign Minister Ricardo Patino declined to call it an expulsion, though Hodges was effectively being kicked out of the country. According to Patino, he met with Hodges over revelations in the leaked cable, which said Ecuadorian President Rafael Correa allegedly was aware of acts of corruption by the police high command. Because the ambassador did not have a satisfactory response, the decision was made that she was not welcome in Ecuador, Patino said, according to Andes. This act "is not against the government of the United States but against a diplomat who made serious statements," Patino said. State Department spokesman Mark Toner said the expulsion was "unjustified." Patino said that during his meeting, he stressed to Hodges how upset the president was over the allegations, and she declined to respond, saying only that it was information stolen from the U.S. government, Andes reported. The cable in question has not yet been posted on the WikiLeaks website but was made available to the Spanish newspaper El Pais, which published it online and first broke the news of the allegations. According to the document available on the website of El Pais, the cable was seeking to revoke the travel visa of Jaime Hurtado, Correa's commanding general of the Ecuadorian National Police, or ENP, from 2008 to 2009. The cable alleges that before Hurtado's ascension to the high post, the embassy had "multiple reports that indicate he used his positions to extort bribes, facilitate human trafficking, misappropriate public funds, obstruct investigations and prosecutions of corrupt colleagues, and engage in other corrupt acts for personal enrichment." Describing the allegations against him, the cable makes a parenthetical note: "Hurtado's corrupt activities were so widely known within the upper ranks of the ENP that some Embassy officials believe that President Correa must have been aware of them when he made the appointment. These observers believe that Correa may have wanted to have an ENP Chief whom he could easily manipulate." The Ecuadorian government has called the allegation that Correa knowingly promoted a corrupt officer to head the police "unacceptable, malicious and reckless."